Check out the photos and background of the fabulous musicians among the Porkroll alumni and friends who play with the band from time to time. Chad "kept the beat with his hands and feet" for Porkroll for over seven years until early 2012. 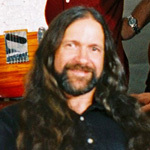 He first joined forces with Neil "Porkroll" Taylor in the mid nineties as the Sound Engineer for Porkroll's previous band, Mudboy. One fateful night Chad sat in on a couple of tunes, and the rest, as they say, is history. He has been behind the drum kit ever since. 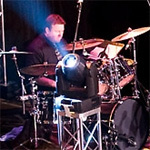 Chad brings over 30 years of experience to the mix, and has played just about every kind of music at one time or another. But for the past decade his heart is in the Blues. "Working with such great musicians is a real treat for me. The Blues can cover a lot of ground, rhythmically speaking and these guys aren't hesitant to try any style or form. It's challenging and a whole lot of fun." Big Note is no stranger to the almighty groove. 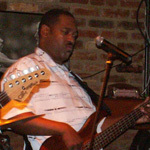 His musical influences range from Delbert McClinton to Sly Stone to Tower of Power to James Brown. 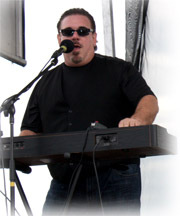 Joe has performed in the Delaware Valley for the past 20 years with such groups as Tequila Kings, Mudboy, Big Rhythm, Lenny & the Soulsenders, The Andy Kimball Express and the Contagious Party Band. Although a guitarist since the age of 5 (leaving many a melted tube amp in his wake), Big Note had been bitten by the B3 bug early on in childhood. He pulls his influences from such notable greats as Jimmy Greenspoon (3 Dog Night), John Lord (Deep Purple), Billy Preston, Bill Payne (Little Feat) as well as his late band mate & fellow keyboardist, Bill “Wolf" Young. 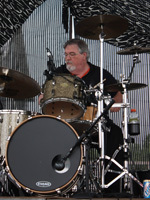 Drummer Larry Hinkel anchored the Porkroll Project rhythm section from 2012 to 2014. As a young man, he was inspired by Muddy Waters and other blues artists from a young age, and never looked back. He brings a lot of experience, musicianship, and enthusiasm to the band. 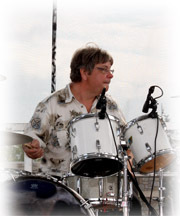 He's a busy man, also drumming for Blues Bizness and the Don Evans Band. During the day, he stays busy running an electrical contracting business. Dave Renz has been playing saxophone professionally on the East Coast since the early 1990's. His compositions and performances have appeared on cd's alongside Steve Howe, Ian Anderson (Jethro Tull), Robert Hazard and Annie Haslam (Renaissance). He has recorded with some of the top players/producers in the industry, most recently for Grammy winning producer Phil Nicolo as part of the Klemmer-Hill-Reid project. James "Doc" White was born and raised in Savannah, GA. With strong musical roots in his family he performed as early as 6 years old with his father's band. James studied classical music in his youth and credits it as a large contributing factor to his love for diversity and arrangements. By his middle teens he found a passion for dance music, jazz, fusion and entertaining. He has spent the better part of the last 20 years writing and performing his own music and adding to the local Philadelphia music scene. As Band leader of The Contagious Party Band "Doc" has made a home for friends and family expressing a true enjoyment for musical showmanship and entertainment. Doc promised himself to always have fun with what he does. That promise spread throughout the Contagious Band and is always evident in their performances no matter the occasion.